Our research goal is to determine whether elevated temperature impacts carbon, water, and nutrient cycles similarly under different daily temperature profiles. 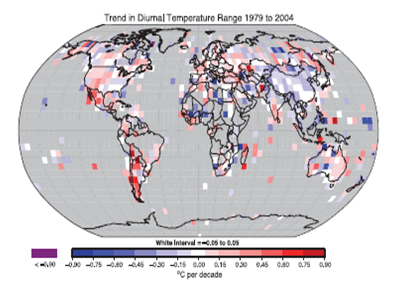 Although extensive research has determined ecosystem responses to equal increases in day and night temperatures, current temperature increases in many regions have been asymmetrical, with increases in minimum temperature (Tmin) exceeding increases in maximum temperature (Tmax), or vice versa, depending on location. On average across the globe, Tmin has increased faster than Tmax, leading to a -0.066°C per decade decrease in diel temperature range between 1950-2004 (Vose et al. 2005). Symmetric is +3.5C warmer all the time. Asymmetric is +5C warmer at dawn (Tmin), and +2.5C warmer at midday (Tmax). The symmetric treatment has higher daily maximum temperatures than the asymmetric treatment, but is cooler at night and in the early morning. Hypothesize 1.) Plants should grow more under symmetric than asymmetric warming, because greater warming during the daytime will enhance photosynthesis more than respiration. Hypothesize 2.) Plants should grow more under asymmetric than symmetric warming, because high midday temperatures are stressful and reduce photosynthesis. Hypothesize 3.) Plants should grow more under asymmetric than symmetric warming, because less severe cold at night would reduce winter dormancy and extend the growing season. Hypothesize 4.) No difference between asymmetric and symmetric treatments, due to a combination of effects.